In the age of information, data is more accessible than ever before. This data can offer great metrics, but can also lead to wasted time over unimportant details. A good digital marketing strategy delivers the correct data which allows you to hone roofing marketing efforts to present the best results and highest ROI for your business. The Roofing Webmasters team offers comprehensive data reports that not only deliver useful, accurate information but also provide you with the details you need to make your roofing marketing efforts more effective than ever. Good online analytics reporting requires not only proper measurement but an accurate assessment of the resulting data. The Roofing Webmasters professionals are experts in the roofing marketing industry and have been generating analytical reports for years. We believe customers who are informed make better decisions and are happier overall with their investment. Since we offer both month-to-month (MTM) plans and pay per lead (PPL) plans, contractors have their choice in payment models. To discuss the advantages of receiving digital marketing reports for your roofing business, give us a call at (800) 353-5758. Both Google tools are free to use, making them especially useful for DIY marketers. 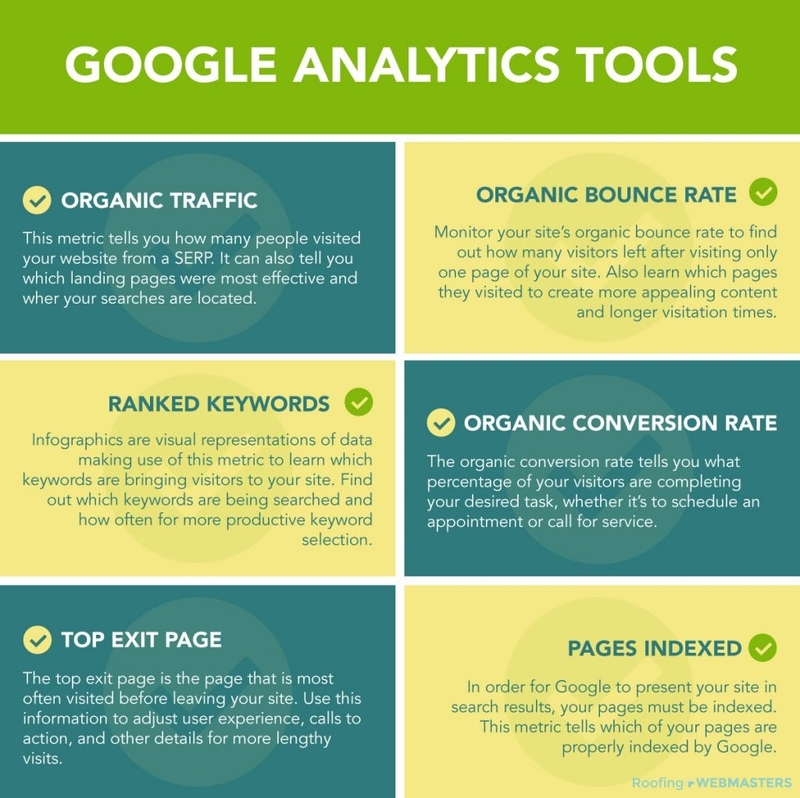 With that said, knowing how to set up, track, and analyze information on Google Analytics is not an easy task. That’s why the Roofing Webmasters team creates custom reports that include Google Analytics metrics to give you a complete overview of your company’s online success. Remember, data is only valuable if it can be analyzed, interpreted, and translated into tangible action. When you need a company that can handle every aspect of marketing reports, choose Roofing Webmasters. Where is your traffic coming from? Where are your leads coming from? Which channels are producing traffic with the highest conversion rates? These questions are on the mind of the average roofing contractor, and they are questions we can answer with digital marketing reports. Source attribution is one of the most critical components of reporting, as it illustrates where leads and traffic are coming from and instructs us on where to allocate our resources. Say, for example, your company is getting most of its leads from PPC ads — you may want to invest more in PPC management and less in social media or SEO. Attribution can be as general or specific as you’d like. For example, we can produce statistics for “social” traffic, and/or we can produce individual metrics for each social platform like Facebook, Instagram, Twitter, etc. The same is true of website traffic. We are able to gauge which visitors are arriving at your site through organic search, and which are finding it through PPC ads, social media posts, or other referral sources. All of this information is useful to roofing companies and it can help improve marketing efficiency over time. Call (800) 353-5758 to learn more about marketing reports. Updated on March 20, 2019 at 4:35 pm by Roofing Webmasters.